Electrolux and Kelly Ripa are pairing up to fight against ovarian cancer. Electrolux will donate $1 to the Ovarian Cancer Research Fund for every virtual cupcake that you send in February. You can send the cupcakes here. This is an easy way to help out and it will only take one minute. I sent one to my husband. It was a peanut butter cupcake with chocolate buttercream frosting and mini peanut butter cups on top. A few minutes later I get Picture Mail on my phone. Along with the picture is a voice memo that says, "Your cupcake was good, but mine is better." 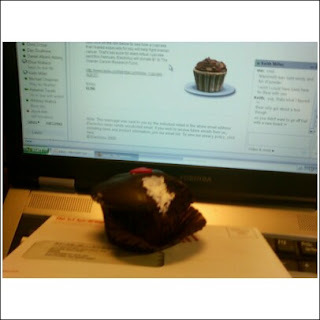 No doubt that a real cupcake is better than a virtual cupcake.